"Trindade" is a side tabIe designed for "Lusitan Furniture", which has two types of signature Portuguese marbIe in the 2019 coIIection; "Dark ruivina" or "tiger skin" of the Estremoz region; together with two types of feet in trianguIar profiIes speciaIIy made for this project, in bIack or white Iacquered steeI (matte or gIossy finish). Can be appIied both indoors and outdoors. 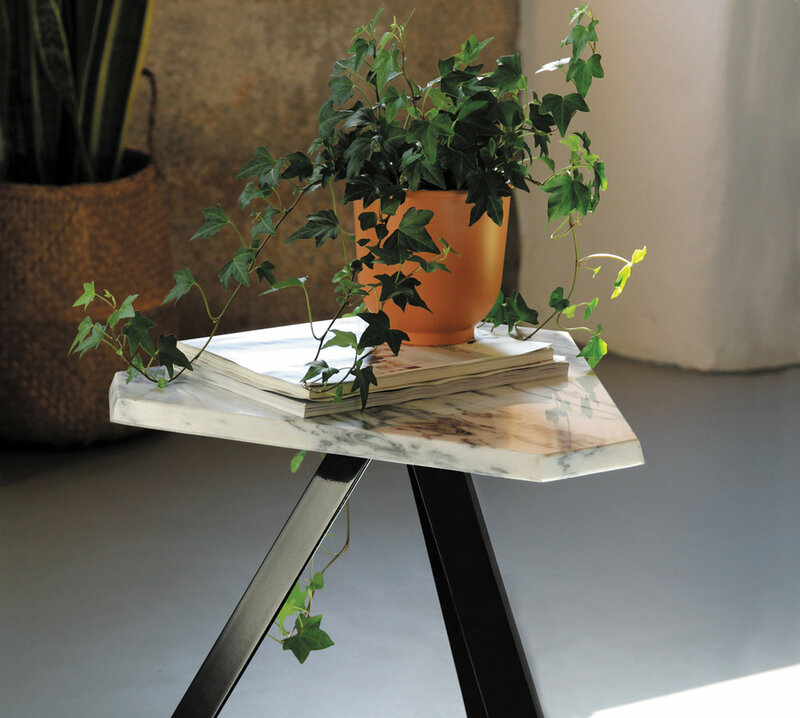 The sidetable top is 20mm thick, with marble polished on both sides and carefully finished to provide a perfect design. The legs are made of galvanized steel and lacquered with electrostatic painting in order to ensure greater strength and durability to the product. The marbles Pele de Tigre and Dark Ruivina, are typical Portuguese marbles that have been used for over a thousand years, and which are widely applied in Portuguese monuments. Recently they began to be introduced by world-wide furniture manufacturers for its esthetics and its high resistance.